Market structure results from a wide range of inputs, from the preferences of individual firms to the rules that govern each trading venue. At no time in the past however has regulation driven market structure like today: bank risk has been substantially reduced, but at a price. Eurex’s ISA Direct model introduces a new way of doing business that will help reduce bank balance sheet pressures. Banks are now more reluctant than in the past to provide services for their buy-side clients that involve renting out their balance sheets, or they are providing services but at much higher fees to cover capital costs. In financial markets, this means that liquidity has decreased while volatility has increased. As banks work to meet the next round of Basel III and domestic rules, including the introduction of the Net Stable Funding Ratio (NSFR), these regulations will further tighten trading and clearing conditions. Our offering is based on Individual Segregated Accounts (ISA) that fully mitigate the risk of default for clearing members. In our model, the buy-side creates a direct contractual relationship with Eurex Clearing as the central counterparty (CCP) (see Exhibit 1). Eurex Clearing members act as the clearing agent, providing mandatory and voluntary services, retaining their client relationships and ability to earn revenues, but are no longer exposed to the counterparty risk of their buy-side client as they are not guaranteeing their performance. Eurex Clearing takes on the role of principal in facing off against the buy-side, which means that the capital and balance sheet impact is greatly reduced in terms of RWA and leverage ratio for the bank acting as clearing agent. This is an important new model for reducing capital costs across a wide variety of tradable instruments including futures, cleared OTC derivatives, repo and securities lending. ISA Direct is a new way for clients, clearing firms and Eurex Clearing as CCP to interact that could become a major game changer in financial markets. The added diversification of direct membership will help reduce the concentration risk currently being experienced in terms of clearing broker availability and capacity. The impacts stretch far and wide, and affect not just cleared products but the bilateral market as well. The change affects more than clearing and settlement operations; the implications reach deep into trading, investment strategy, collateral transformation and market structure across the financial services industry. We have already identified three areas where ISA Direct is likely to change market structure: swaps pricing, collateral management and cross-product trading. The swaps pricing market is currently in some disarray ⎼ negative swaps spreads, CCP basis and higher capital costs all hurt liquidity and the ability of end users to hedge at attractive levels. There are also issues associated with negative rates as well as the difference between EONIA and the true funding cost, both of which are impacting valuations of OTC IRS. In the US dollar market, Interest Rate Swaps are currently yielding negative returns to US Treasuries reflecting the fact that regulatory changes have altered the fundamentals of swap pricing. Central clearing has transformed the nature of counterparty credit risk by ensuring that OTC IRS trades continue even if a bank defaults. The removal of credit risk means that the spread between swaps and treasuries is now a reflection of the difference in capital costs plus supply and demand. This has led to many asset managers and hedge funds withdrawing from one of their traditional investment strategies and hedges against stressed market tail risk, the spread widening trade: buy treasuries, pay fixed swap. What has made this even less attractive is the negative carry resulting from repos trading higher than LIBOR, which is not how markets are supposed to trade. Secured debt, like a mortgage, is supposed to be less expensive than unsecured debt like credit cards. However, the reliance on bank balance sheets and the real-world impact of regulatory costs has made secured repo more expensive than unsecured LIBOR, which in many cases is based on a hypothetical rate and not observed transactions. This has severely reduced the bilateral activity in these types of trades, which in turn prevents traders from arbitraging out inefficiencies in bond market pricing. What if instead of bilateral repo as the hedge, a centrally cleared repo or equivalent risk-based transaction could occur that did not take up bank balance sheet? In this case the extra capital cost of the repo would be reduced and allow repo to be below LIBOR, where it belongs (see Exhibit 2). Since repo is currently more expensive than LIBOR because of the added balance sheet cost, removing this encumbrance should solve the pricing problem. In the ISA Direct model, buy-side firms and the CCP are principals to the trade with the bank playing a service provider role. While there are still some costs to the bank in trading derivatives and repo through an exchange/CCP, these costs are much lower than in the bilateral market. It stands to reason then that derivatives and repo with ISA Direct should allow Interest Rate Swaps and repos to be profitable again. ISA Direct should not only help reduce the amount of balance sheet required, it should also improve pricing due to lower capital costs. Arguably, lower balance sheet costs for banks mean less friction in the markets and more transactional volume. When looking at futures, OTC derivatives, repo and securities lending as one basket of collateralized trading opportunities, the ISA Direct model shows immediate benefits when clearing firms can help clients minimize collateral exposure on the CCP. This is the basic idea of a CCP that clears across multiple products. As more derivatives trading activity occurs, both buyers and sellers have higher collateral demands. Repo and securities lending on the other hand deliver collateral supply to the market. Being able to generate cash from securities to cover variation margin or being able to invest cash secured against securities that can be reused to cover initial margin help to make the market more efficient. This is one of the most significant practical challenges that many buy-side firms face with the introduction of mandatory clearing and collateralisation of non-cleared derivatives. By keeping the collateral within the same clearing ecosystem, not only does it reduce settlement failures and transit risk, but should will also o reduce settlement fees. For banks, the ability to net these transactions through a single counterparty ⎼ the CCP, with matching currency, security and settlement system ⎼ allows them to benefit from lower collateral requirements and lower capital exposures. Each financial product has its own role to play in the markets. Futures are best for highly standardized products while OTC derivatives fare best for more client-specific trading and hedging opportunities. Repo meets the needs of both cash borrowers and collateral borrowers, while securities loans deliver high quality collateral and enable short selling opportunities. There is no reason to think that one product should win out over another, but rather they are all part of a working whole. The responsibility of banks and investors is finding the right model and the right trading instrument to meet an investment strategy. ISA Direct helps by maintaining and widening access to a variety of traded products, each of which has a valuable and legitimate role for investor strategies. Some bilateral products may be difficult for bank balance sheets, but by reducing capital constraints on a CCP, a clearer picture of the costs and benefits emerge. Swap futures won’t replace OTC derivatives but they do have a role to play in helping banks hedge gap risk, and as a warehouse for investors switching positions. Basis trades on bond futures help maintain efficient markets. Banks looking to finance illiquid assets already know that these products do not clear well, but a range of products on a CCP can help bridge the gap between traditional listed products and the OTC derivatives world, and between on exchange and off exchange. 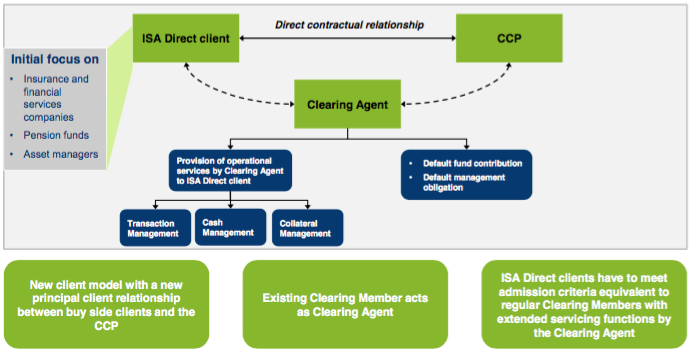 ISA Direct not only takes this existing role of the CCP and makes it less expensive for banks and their clearing clients, it also enables a wider variety of clients to trade with each other across all product lines because they can use a single membership with a single operational, legal and risk framework. ISA Direct is really about building healthy, robust markets that work in a new market structure defined by regulation. Healthy markets are not just talk; they are critical for the functioning of governments and private companies. In Europe, we have 23 bond markets that operate as part of the European Union, reliant on each domestic market functioning as best it can. When one part of these markets does not work, that creates a potential lack of liquidity that can threaten the underlying health of the whole. In European bond markets specifically, each individual domestic market needs a mix of cash, repo, futures and OTC derivatives, as well as domestic collateral to cover initial margin. There also needs to be access for domestic and international market participants across these products. Eurex Clearing works with domestic Central Banks, government agencies and local market participants to build up each individual market structure; strong domestic markets are the building blocks for a strong European market. By keeping the functional role of a bank intact while reducing balance sheet costs, ISA Direct supports the growth of a new way to look at market structure. Balance sheet costs have already changed important dynamics in pricing, trading and liquidity for both bilateral and exchange-traded products. Arguably, this has not been beneficial for issuers, investors or banks themselves and has been in part responsible for reducing liquidity in the markets as banks have withdrawn from market making and reduced their balance sheets. Given the high costs of client clearing coupled with the withdrawal of a number of firms, we have also seen an increase in concentration risk to the largest banks with 70% of client money in the US held by the top five FCMs. ISA Direct helps to solve the problems of liquidity and concentration risk by bringing more trading counterparties directly together at a reasonable economic price in a way that utilizes less capital and balance sheet. A healthy market needs a balance of buyers, sellers and liquidity providers. By supporting this fundamental restructuring in the market, where cost and pricing reflects capital costs and counterparty exposure, ISA Direct is working to build a successful future market structure. 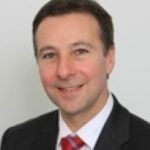 Philip Simons has 30 years of experience in the financial industry where he started life as a swaps trader before moving to the clearing world, initially heading up the clearing business at UBS followed by Cargill. Philip later moved into the custody and collateral management space at J.P.Morgan before joining Deutsche Börse Group. Philip initially joined as head of the Clearing Sales and Relationship Management Section and is now Global Head of Fixed Income Trading & Clearing Sales for Eurex covering both the Exchange and the Clearing House. Philip is responsible for building strong relationships with clients, attracting new trading and clearing members and promoting new products and services.